2009.12.06 - Inquiry into integer ratios produced recent research results. Here follows highlights and a permalink. 2009.10.10 - Walk with the Ancients begins today. The Newark Earthworks Center has organized a seventy-mile, seven-day walk with several dozen participants traversing roughly the route of the "Great Hopewell Road." They depart Ohio's Scioto Valley earthworks concentration near Chillicothe from Hopewell Culture National Historical Park and hike to the Newark Octagon. After canoeing across the Scioto from Mound City, the walk passes through Hopeton Earthworks. The trajectory of the Great Hopewell Road from Newark points to the Chilicothe area earthworks. I discuss their spatial relationhip below. In 1861 James Salisbury reported following perfectly straight, parallel, ancient earthwork walls for about six miles from Newark. While modern developments and agricultural activity have all but obliterated the earthen embankments, their existence was documented by aerial observations in the last century. In the 1995 paper Tracking Ohio's Great Hopewell Road (Archaeology 48(6):52-56), archaeologist Dr. Bradley T. Lepper renewed attention to the Great Hopewell Road and reported traces of parallel lines along the projected route. The Walk with the Ancients is focused on this ancient linear earthwork, a hypothetical continuous straight trackway from Newark to the Scioto Valley. This image capture from Google Earth features a transparent overlay of the 1934 aerial photograph depicted in Romain and Burks 2008. The white line transecting the circular enclosure connects Newark Octagon and Highbank Circle. I added the green lines to accentuate the faint crop marks of the Great Hopewell Road. Download the Google Earth kmz file. Contemporary religious interpretations of the past have entered into recent popular dialogue about the Great Hopewell Road. Several archaeologists are equating the earthwork with "pilgrimage" and Newark with a presumed "Holy Land" of some sort, attracting distant travelers along the "holy pilgrim's path" because the "basic idea is pilgrimage." Old World religious conceptions should not be super-imposed on Native American cultures. Just like it was wrong to say the Ten Tribes of Israel built Newark, so also it is wrong to call Newark a Jerusalem or Mecca, especially when there is no material evidence to go with the belief. Any time someone claims to know what people were thinking in prehistory, I advise skepticism. While imagined religious belief may have some place in science, to force-fit the earthworks into European religious moulds obfuscates the significance of the astronomy, geodesy, and likely the actual function of these world-class monuments. Opinions and beliefs are not science, of course. However, interpretation of material evidence is part of archaeology and discussions of interpretations are part of doing science and advance our knowledge. Even at Pueblo Alto, a Chacoan pueblo in New Mexico, where there is a midden with the vast quantity of broken pottery evidencing feasting and people gathering, the abundance of material evidence does not infer the gatherings were religious. Where is the evidence of gatherings at Newark? It does not exist except that the earthworks themselves required builders. The Flint Ridge quarry near Newark may have attracted many people. We know Flint Ridge tools dispersed over great distances, but trade and resource acquisition are not religion. Material remains, especially large constructs, do provide indications of the ideation and the purposes of builders. At Newark, the evidence of astronomy is uncontested and the geodesy is explicit and precise. That evidence infers science rather than religion as the underlying activity at Newark. Newark has been interpreted as an observatory and the evidence indicates this is a reasonable interpretation. My research has added additional new material supportive of this conclusion. Two sites at opposite terminii of the Great Hopewell Road, Newark Octagon and Hopeton Earthwork, present a noteworthy spatial relationship. The N-S (0.6685°) and E-W (0.5348°) differences from the center of the Octagon to the center of Hopeton Circle present a precise ratio, 1.0 to 0.80 (5:4), a ratio also expressed by the geometry of the Octagon. The longitude difference of 0.5348° is related to lunar periods and eclipses precessing orbits. On the earth, of course, the actual triangle is of different proportions because the size of a degree of longitude is a function of latitude. 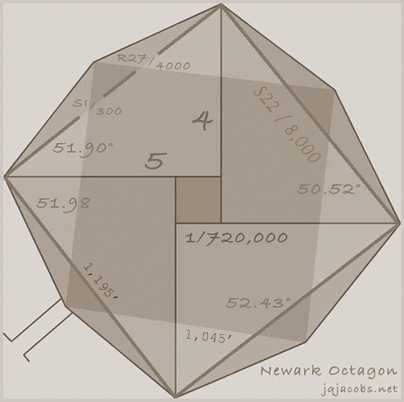 At Newark, a degree of latitude is 1.30 times longer than a degree of longitude, a ratio also presented by the Octagon's geometry. The 52.43° tangent of 1.30 is an azimuth of two Octagon vertices. Middleton reported a 51.45° azimuth for the Observatory Circle, and 51.34° is the tangent of 5/4. One seventh of a circle is 51.42° and the atan of 4/pi equals 51.854 degrees. For Newark and the Chillicothe earthworks, the lunar major northerly rise azimuth is in this same range, as is the azimuth of the Octagon. My GPS readings produced a 51.52° azimuth from the center of Observatory Mound to the gateway at the opposite apex of the Octagon work. 2009.08.04 - Following archaeology news sites led to a new Göbekli Tepe article with this embedded video, now also embedded in my article: The Ur and Harran Latitudes, and Göbekli Tepe. 2009.08.04 - Had I known what and how much specialized knowledge can be required in archaeology, I might have chosen a different path. To understand an ancient activity, you need to understand the particular field of study involved. 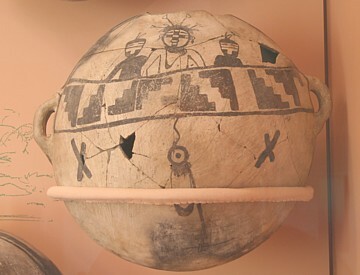 To analyze ancient pottery, you need to know ceramics, to research ancient astronomers, you have to learn astronomy. Archaeology can be very educational. Now consider this problem, "What if an ancient culture knew more than we do?" How can we understand what they did if we don't yet know what they knew? 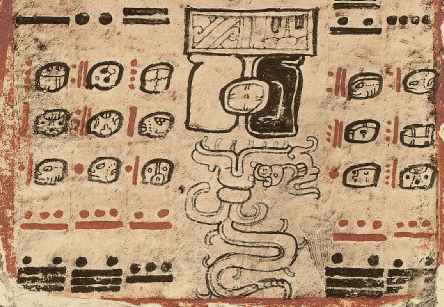 This was the situation when the Maya libraries were burned. Religious fundamentalists bent on destroying the work of the devil destroyed the most significant astronomy texts in human history. Does the same situation prevail when ancient monuments are bulldozed? Do we even know what we are destroying? Today I woke up dreaming about cosmological mathematics and a vexing question about lunar eclipse precessing orbit completions. The Metonic eclipse node precesses the orbits node and the lunar orbits node precesses integer solar orbits. The implications may be surprising if ancient astronomers understood how the eclipse timing demonstrates earth's heliocentric orbit and quantifies solar orbits. In geometry, a theorem is a statement that has been proven true. I'll skip the obvious proof—the geometric circularity theorem of orbits is simple to understand. Take two earth motions, rotation and solar orbit; given one solar orbit there is one less day than rotations. The expression x - 1 = y applies to two related circular motions equated to the same motion, one sidereal and one synodic. Likewise with the two motions earth orbit and lunar orbit; given one solar orbit there is one less lunar synodic period than sidereal lunar orbits. In both cases, given one solar orbit, obviously x - 1 = y. Once a theorem is proven in geometry it often has other applications. In astronomy, the theorem applies to other circular motions related to orbiting the sun and the earth, and all these interrelate in spatial and temporal dimensions. Solar orbit, earth rotation, and lunar orbit share the same direction. When the motion direction is opposed to orbit, the same theorem applies with the sign reversed. Equatorial/axial precession, lunar nodal period, and eclipse nodal period are retrograde motions, precessionary periods. Hence, years per precession cycle equals orbits plus one, or x + 1 = y. The lunar node precedes lunar orbit, so in one orbit of the receding node there is one more nodal period than lunar orbits. The eclipse nodal period (eclipse "year") precedes solar orbit, so there is one less nodal period than synodic period per orbital circulation of the eclipse node. In light of the sign reversal, the whole-system algebraic is only correct for a heliocentric version; only thus does the math "fit." 2009.07.13 - I just posted a new page, Eclipses, Cosmic Clockwork of the Ancients. One section presents astronomy basics in the easiest terms possible (hopefully). The focus is on naked-eye astronomy. My intent is to convey the importance of eclipses to ancient astronomy, and to our knowledge of ancient astronomy. 2009.07.19 - Eclipse Calc, an eclipse calculator describes the eclipse related features in Epoch v2009. 2009.06.30 - Epoch_v2009 is updated. The "calc" worksheet has a new orbit calc table to equate lunar and solar orbit motion. You enter the number of days and read the calculations. Planetary orbits and synodic cycles are also converted. New code terms for the planetry periods are added using the latest values available. A planetary code term lookup menu is on the same page. And, more clues to the ancient mystery puzzle are now in plain sight. Enjoy! 2009.04.04 - I've discussed geodetic geometry of monument latitudes .... One of the oldest known stone circles, situated one-fourth the distance from equator to pole at Nabta Playa, Egypt, infers intentional latitude placement originates at an early date. In contrast to simple integers of spatial geometry, the latitudes at Newark and Marietta present solar and lunar modules ... Marietta's latitude equals 40 times solar orbit per day (40 SO). The same astronomy module arose in relation to Ur Ziggurat ... The Newark to Tikal arc distance equals 24.0 SO .... In about 322 A.D, obliquity of the ecliptic—the inclination angle of the earth's rotation axis—also equaled exactly 24 SO. Permalink. While the 100 Hours of Astronomy global astronomy event this weekend discovers the Universe with telescopes, my International Year of Astronomy 2009 focus remains on counting and thinking, and on finding scientific geodetic data for cultural monuments connected with astronomy. GPS data appreciated. 2009.04.09 - Epoch_v2009.xls is updated, introducing a more comprehensive variable set with improved AeGeo terms and code. More lookups, an eclipse calculator, and selector menus enhance the applet's utility. Development continues, with several recent formula refinements yet to follow. 2009.02.02 - Google Earth v5.0 (beta) has new layers - A recent e-mail alerted me to new features in Google Earth 5.0. Video Tour. The 'previous images' layer, controlled with a user chronology slider, is very useful to archaeologists. Now, a variety of aerial images for the same place provide more visual information. Also, click the toolbar and v5 will record your place flying, allowing creation and sharing of visual experiences. The new flying under the ocean feature is not archaeology, but the vastly improved oeanographic imagery makes visualization of the Pleistocene shoreline much easier. I still have not explored the cosmology features. Will a temporal slider one day allow capture of an ancient moonrise over the Octagon Work? Will the ocean go back down? I'm re-reading David Macaulay's 1979 Motel of the Mysteries, a hilarious tour of archaeological interpretation, methodology, and critical thinking. His volume improves with age (perhaps just with my age?). I scored an original cloth edition some library had withdrawn. How such classics are discarded by libraries is another mystery. It has the 50 cents tag, the 818 MAC tag, the bold WITHDRAWN stamps, and the damage from tearing out the borrower's card sleeve and the library label. Evidence of which library was sooo ignorant is now lost for all time under a layer of pollutantus aliterati. Anyway, if you are an archaeo student, Motel of the Mysteries is a must read before taking M&T, Methods and Theory, and a great read before taking your first anthropology class. I find it useful in imagining how other cultures might interpret Eastern Usa today, and how ancient humans might react to a real Great Urn when it suddenly flushes. If concepts like a new layer of pollutantus gravitas and pollutantus literati sound interesting, check out the tome, or buy it cheap. Apparently, used book stores are today's investor paradise, as libraries are disvested of knowledge. 2009.01.27 - A recent e-mail exchange led to reconsidering the English foot as a geodetic construct. ... at Avebury's latitude, a meridian degree measures 365,014.7 feet, not 365,256 as would be expected for days per orbit ... where the foot fits matters. Permalink. "At Stonehenge, there are 365,000 feet per meridian degree"
2009.01.24 - Data Visualization in Archaeology - Place relational linking in virtual space provides some of the same benefits as going to the actual place, and time. 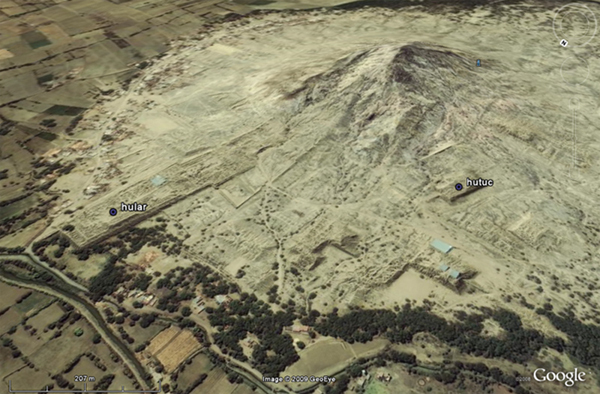 In Google Earth, I just stumbled into another lost city of pyramids in Peru, Tucume. I also got lucky at the bookstore today, and found a Lister and Lister Those Who Came Before clothbound edition, a 1983 state-of-the-art visual experience of Southwestern archaeology in the United States National Parks System.
" ... the prehispanic site of Pinchango Alto ... we used a model helicopter carrying a CMOS camera to acquire a series of vertical aerial images for photogrammetric recording and 3D modeling of the site and the surrounding terrain. "... automatic photogrammetric processing allows for very efficient procedures and for new kinds of results ..."
View a 3D model of the Tucume adobe complex textured with old aerial images. Huaca Larga, is the 545 m long mound topped with an Inka stone building. Below follows a Google Earth high resolution image of Tucume. 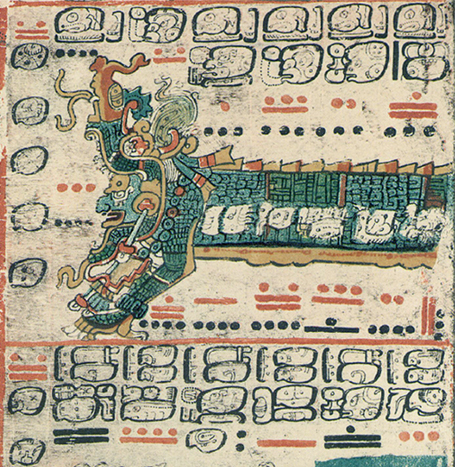 Another large huaca is not shown in this screen capture. 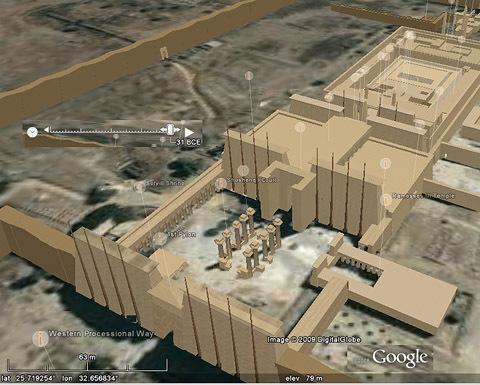 Also in the same issue, 3D Source for Egyptian Monument Information System and Replicas of world - a reality soon. 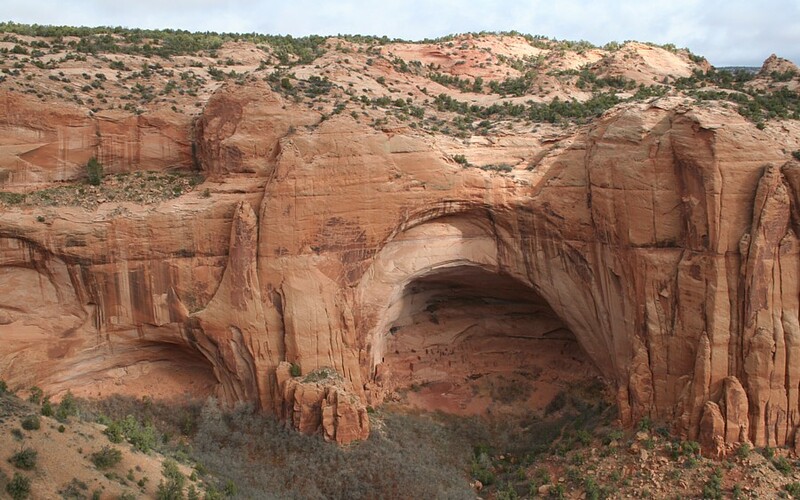 Aerial survey and ground captured data are being transformed into incredibly precise virtual replicas of the world, especially when combinded with 3D visualization multimedia. I was also recently excited by UCLA's impressive Google Earth model of Karnak ruins, featuring a temporal slider that allows you to construct the site chronologically! Archaeologists have already added a temporal dimension to data visualization. From an educators perspective, the interactivity dimension is perhaps the most useful. When the viewer controls the joystick to the past, that dimension becomes more engaging. The floating placemarks (image above) lead to photographically rich illustrations and websites. See: Digital Karnak from UCLA. "The colossal site of Karnak is one of the largest temple complexes in the world, with an incredibly rich architectural, ritual, religious, economic, social and political history. The Amun-Ra precinct, which includes an astonishing number of individual temples, shrines and processional ways, stands as a micro-cosmos of ancient Egypt." including a link to Wordle. I could not resist creating a few. the basic facts with graphics and links to the photo galleries and placemarks. 2009.01.06 - Newark Archaeogeodesy - When is a prehistoric monument an astronomical observatory? In both the popular press and academic articles, this question is often not addressed when claims of astronomical observations are made. Archaeogeodesy offers avenues of inquiry for the question, albeit these transcend current paradigms in archaeology. Well, reality is transcendental, independent of thought about it. Paradigms in science, while resistant to alterations, do crumble in the face of incontrovertible evidence even if slowly. 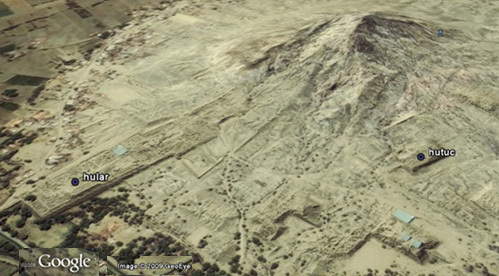 The Google Earth file I'm posting today, Newark Archaeogeodesy, challenges archaeological paradigms with new evidence of the sophistication of ancient geodesy and astronomy in the Americas. As incontrovertible as the actuality of arc distances and astronomical constants may be, I expect considerable resistance from archaeologists regarding acceptance of what the data I present infers. As usual I'm trying to steer clear of interpretations. I'm presenting evidence, "facts" I determine with transparent methods. Nonetheless, the inferences are very apparent. 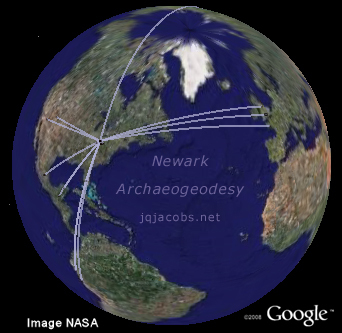 If ancient astronomy and geodesy questions interest you, check out the web article, Newark Archaeogeodesy, where I'll present and discuss the findings in the Newark Arcs .kmz placemarks file. If you detest challenges to your paradigms, well, run and hide in that darkness because the monuments are not going to move to new positions to accommodate your thinking. If you are new to Google Earth, the virtual globe browser, check out my Ancient Monuments Placemarks page first. I first presented an Avebury arcs file on Winter Solstice a year ago, in Winter Solstice and Long Barrows. A new Avebury Lunar Arcs placemarks file focuses on the core Averbury area and lunar constants. It is also no coincidence that today's release comes on the Epiphany instead of the solstice, on the feast of the Three Wise Men in Christian traditions. I'm not saying I expect readers will have an epiphany. The evidence does infer new meaning for "wise men" and women in antiquity. That is the discussion I hope will ensue, along with one about paradigms in science and their origins in culture and history. The questions I offer this semester are these: "Are we as 'wise' as humans were in prehistory?" and "If not, how would we know?" Several tools have been updated for the upcoming semester. Epoch 2000 has been displaced by Epoch v2009. More variables have been added to the code. The new version contains calculators employing the codes, including an eclipse calculator. There are also handy code and values lookup menus. 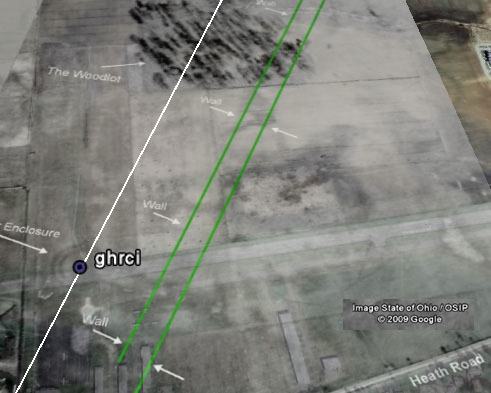 Archaeogeodesy v2009 also has these same new features, plus more site coordinates. Please report any bugs. Happy Julian New Year and Happy Epihany too. © 2009 by James Q. Jacobs. All Rights Reserved.